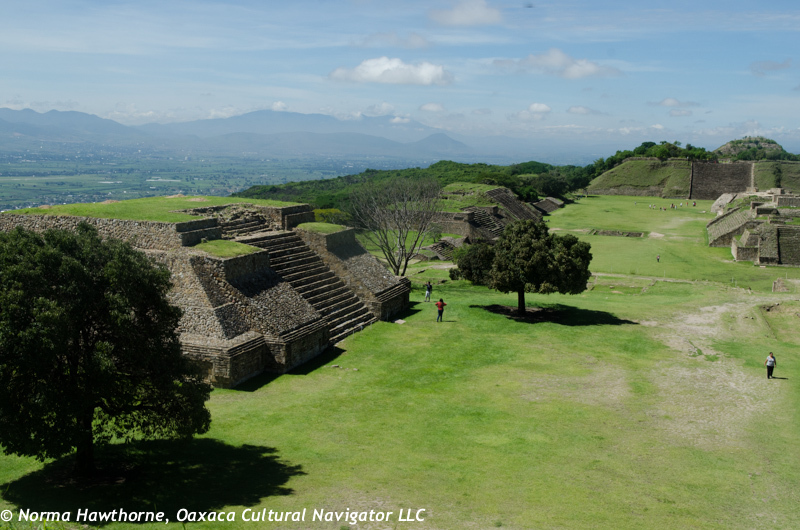 The UNESCO World Heritage archeological site of Monte Alban never ceases to capture and hold my attention. 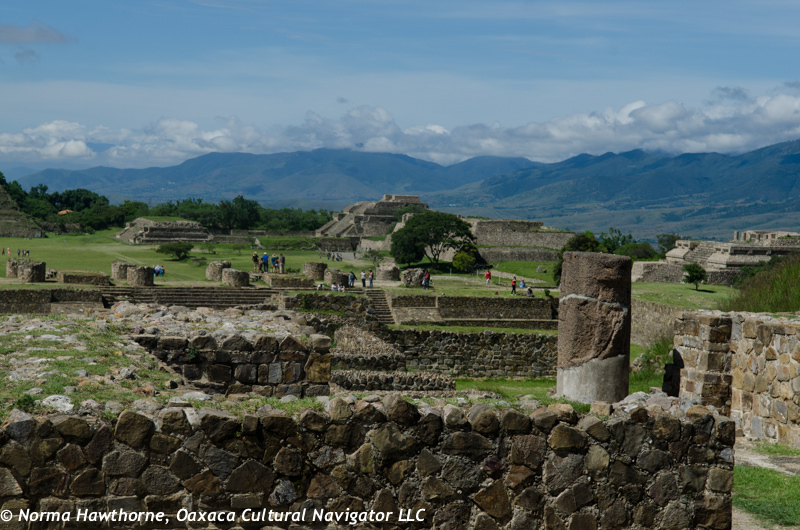 I go there every time I host visitors to Oaxaca and each time there is something new that I notice or an area that is recently restored. 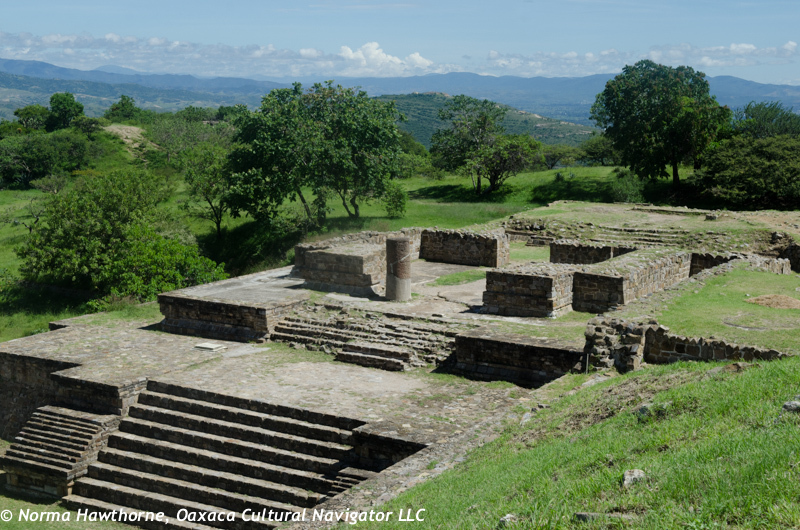 The Spanish conquerors named Monte Alban, or white mountain, because the hill was in bloom with white flowering trees when they arrived. This week, the sky was nearly flawless blue with outstanding big, white cloud formations. I don’t remember a more beautiful, breathtaking day here. 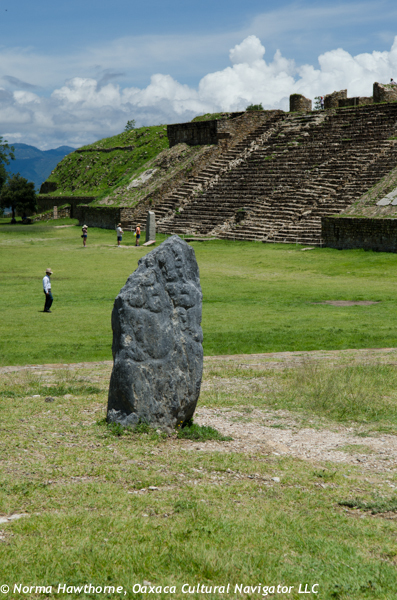 The best way to enter the site is to begin on the north platform, the highest place. After you go through the ticket turn-style make a right turn and continue up the hill. 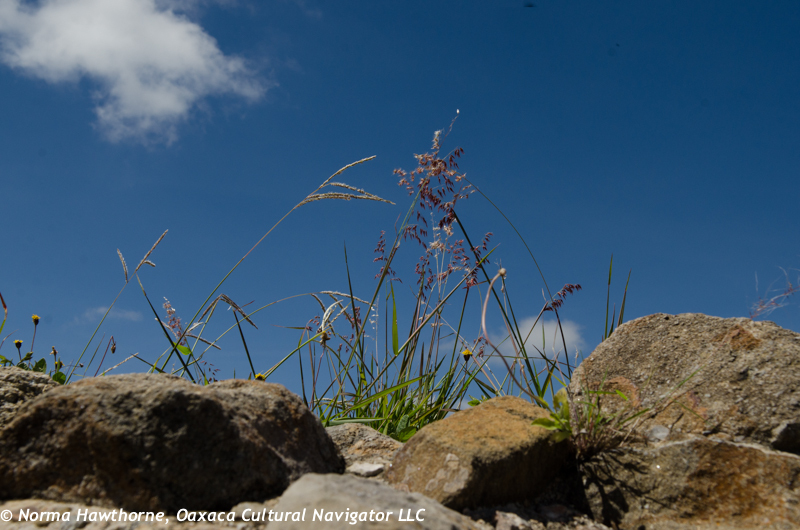 The path isn’t well-marked, but the trail is well-traveled, so you will figure it out. 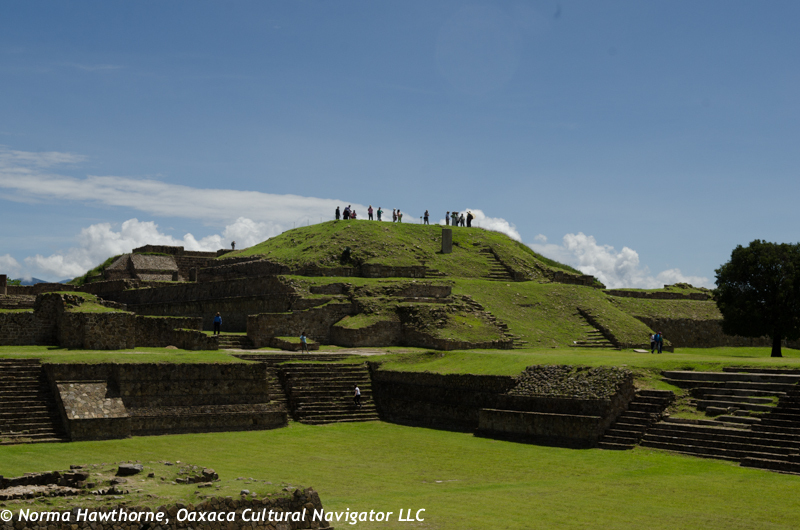 Even though it looks daunting, be sure to climb the pyramids. Otherwise, you will miss the most stunning views. On the main level of the platform you will see carved stones depicting men captured in war. 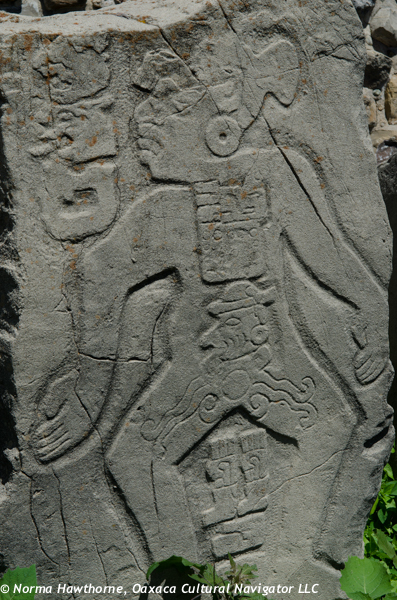 Called Los Danzantes, or dancers, these are replicas. 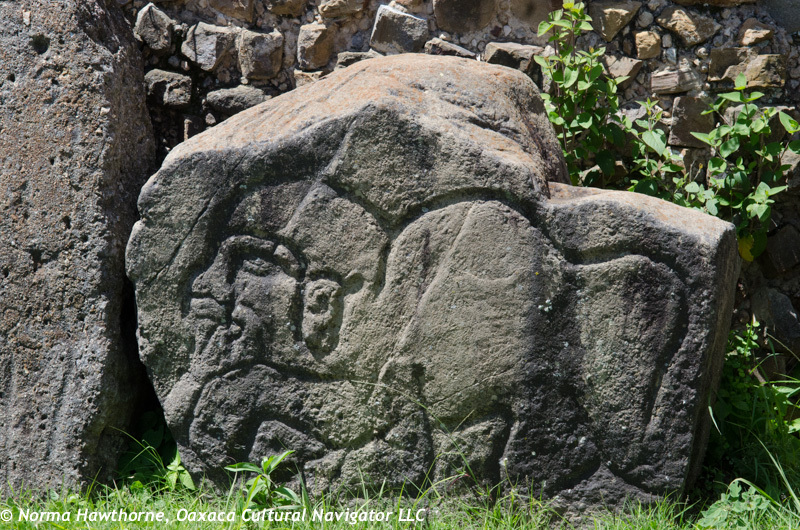 The originals are in the museum on site and in the National Anthropology Museum in Mexico City. 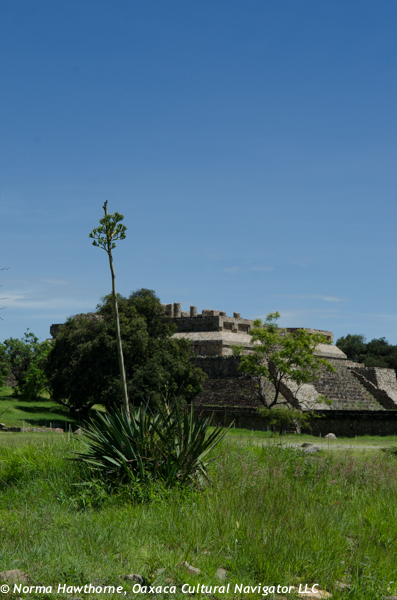 Summer in Oaxaca is very temperate and GREEN. Now, the rainy season that brings torrents of water is almost over, and so we may get a late afternoon or evening shower, which is lovely, and tends to cools things off — a perfect temperature for sleeping. 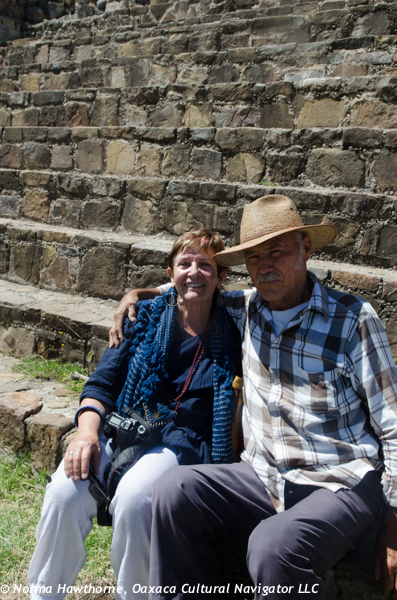 By the time we arrived at Monte Alban, it was almost ten-thirty in the morning, and the sun was already strong. 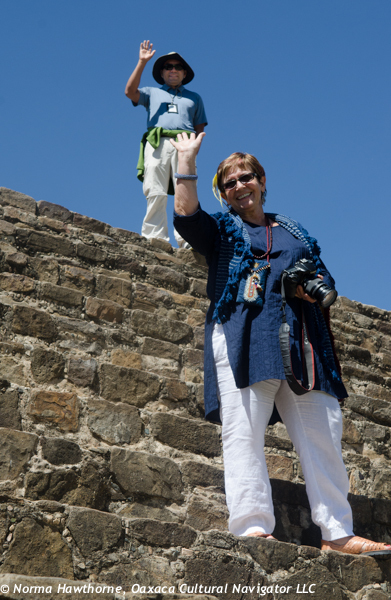 Our guide extraordinaire, Rene Cabrera Arroyo, was prepared and had plenty of bottled water for us. 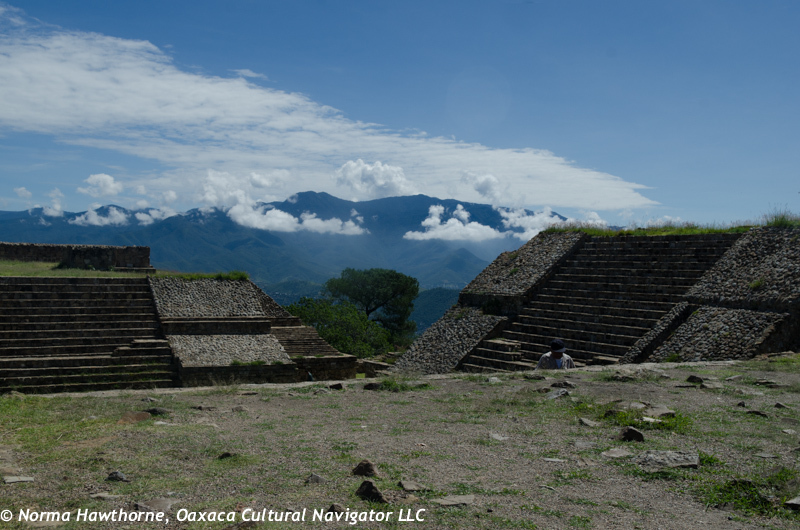 It took about two hours to walk the site and get a complete explanation of Zapotec history, conquests, relationships with the Aztecs and Mixtecs, and the political and religious structure at the time they were at the height of their power. 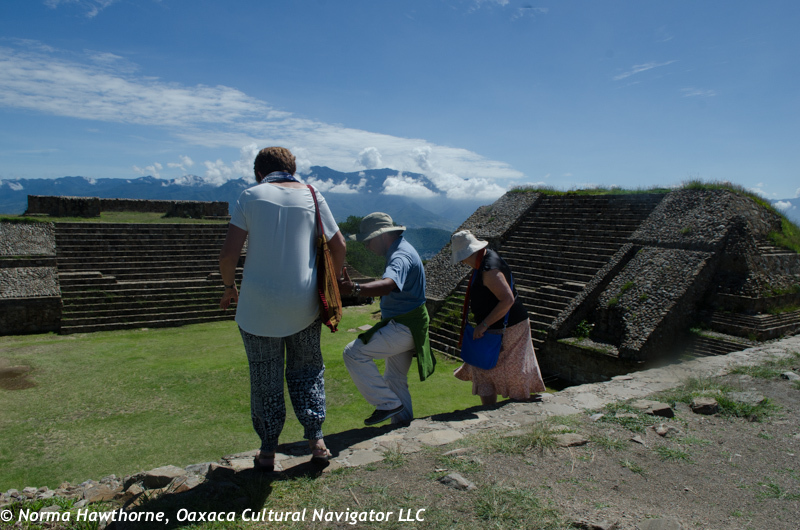 It’s Guelaguetza time and Monte Alban crawling with visitors who come to Oaxaca from throughout Mexico and many foreign countries. I am hearing a cacophony of languages: German, British English, Australian English, Dutch, French, Japanese and Chinese, as well as Spanish and American English. 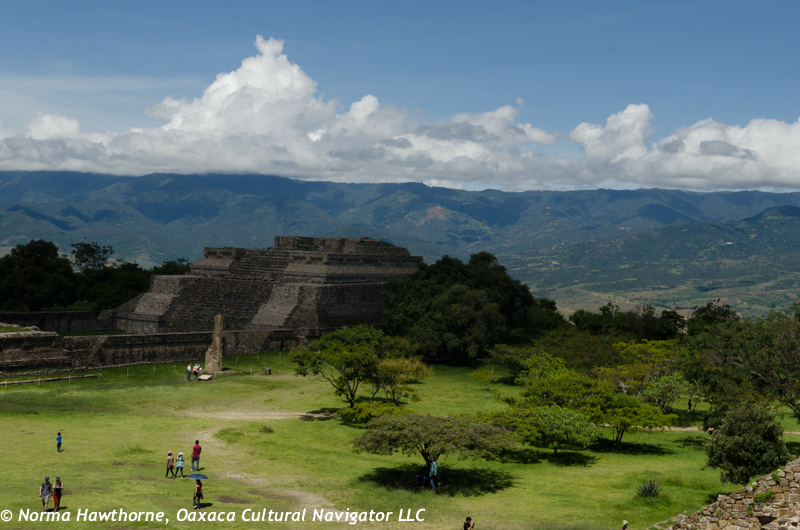 Oaxaca is a wonderful place to visit and bring the family for summer vacation. It’s safe, educational, fun and affordable. Entry fees are 59 pesos per person. That translates to about $4.25 each. We’d love to see you here! 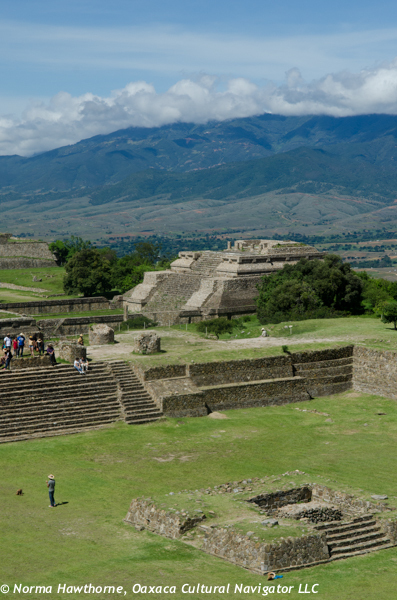 After Monte Alban, we went off to Atzompa, the nearby village of potters who supplied the priests and nobles with utilitarian and ceremonial clay vessels. My advice: wear sturdy shoes for rock climbing, use a sun hat, sun screen, and pack a water bottle — as important as your camera! 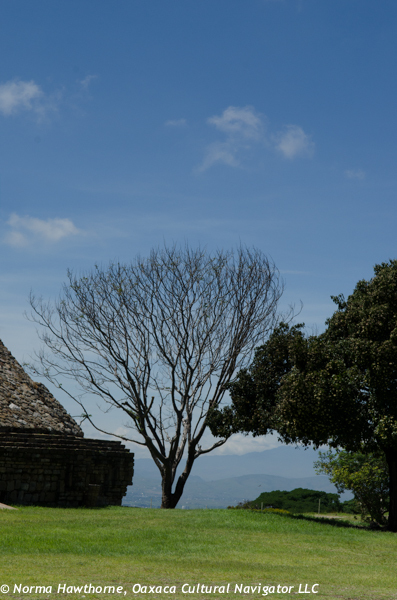 And, consider hiring a licensed guide who knows the in-depth history of the place. It will enrich your visit. 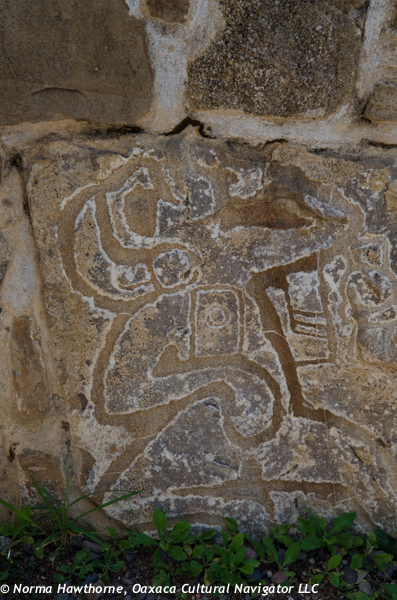 This entry was posted in Cultural Commentary, Oaxaca travel, Travel & Tourism and tagged archeology, guide, Mexico, Monte Alban, Oaxaca, tour, Zapotec. Bookmark the permalink.